If you look at this topic here; https://www.cloudyni...inodobson-r3071 , you'll see that the twin dobsonian of 18" he's using, is akin/equivalent to one 25" single, using the fact the formula is about 1,42 times the single diameter of the mirror. Once again, I would think this is cost saving, especially if you go to larger diameters. that's because the expense goes up non-linear the bigger it gets. This is *certainly* true for large apo refractors. I'm wondering though: does the same principle holds up for refractors too, or is it more or lower than 1.42? Also, is it cumulative? (I would think, logically, yes to both questions, but I'm not the expert here). Meaning, if you have a a double 'binocular' telescope - a quadroscoop, of say 10", would you get 10 x 1.42 = 14,2 x 1.42 = 20,16". Which would be larger than the largest refractor in the world still in use. So, again: why don't we see that? I mean, for smaller apertures, this may not outweigh the extra cost of the tubes and set-up and all that, but that doesn't hold true for big apertures. A 10" refractor might set you back 20000 dollar. 4 times makes it 80000, and add some 20000 extra overhead to it. So, say $100000. However, a 20+" refractror will set you back 3-4 million. So one would think people going for a big aperture refractor would rather go a quadroscope or binoscoop, rather than a single lens. I'm sure people will say 'collimation' is the big drawback no doubt, but if you read the article, even for the dobsonians that didn't actually present much problem, so it should be even less for refractors. Also, in that article there also a lot of additional advantages described, apart from the bigger 'composed' aparture. Anyway, why isn't this pursuit more? Yes, I know the market isn't that big for big refractors anyway, but still, where there is, there should be a market for it, but one hardly sees one. As far as I can see, comparing the prices, up to about 8" should be cheaper than the same/similar one big aparture, when it comes to apo's. Edited by SPastroneby, 20 August 2017 - 11:37 AM. If you have not considered how to get two light cones to converge to the focal plane of a single eyepiece, I would start there. If you have considered this, I would very much like to see your idea for how to achieve this. My guess is that it would take some rather complex optics, and worse than that, some expensive optics. Remember, they have to arrive in the same orientation. When you start working with prisms and mirrors, it is easy to get one image reversed or inverted (or both) from the other. Now maybe there is a simply way to do it, but I have my doubts that it could be done without some fancy optical solution. Next, did you happen to notice the weight of the instrument in the link above? It was 330 lbs. And sure, it beat out a 20" scope, but hey, two 18" scopes together should indeed beat out one 20" mirror. No surprise. Now, I like binoculars. I like them very much. But even engineering binoculars to work with modern wide field eyepieces as it turns out is very difficult and expensive because the prisms have to be very large and this makes a big binocular (as with the scope above) very heavy. And this is the downfall of these kinds of systems. The size, weight, and complexity gets very daunting. My advice? If you want to view with both eyes, buy a PVS-7 image intensified binoviewer and plug it into a 10" Dob. Now you can use both eyes, and it will be the equivalent of a 20" dob (and some people say more, but I like to be conservative). You could plug it into a refractor, but refractors are so slow. Why would you want to do that? I can see the Horse Head Nebula from my red zone skies using a 5.5" reflector. Lets see you do that with a 4" binocular. Think about the problem of bringing two light cones to the field stop of a single eyepiece and remember, they have to arrive in the right orientation left/right/up/down. I admire your passion about doing this, but the complexity of such a system is where you really need to start. The theory might be sound, but the actual engineering I think would be substantial. Edited by Eddgie, 19 August 2017 - 08:57 PM. Rarely are both human eyes of equal ability, but your brain will average it out. So your bad eye dumbs down the view you get with both. As we age all sorts of bino vision issues emerge, including cornea yellowing, macular degeneration which can alter eye focal lengths and distort bino vision. Consider this if you contemplating building an expensive bino viewer. Your likely to find a very small potential market when it comes time to sell it, and the time will come. As a theoretical question and design issue, of course it is worthy of discussion, but as a practical device there are likely better ways to spend your money. Edited by glend, 19 August 2017 - 09:01 PM. In the binocular forum they would contest the assertion that a binocular telescope is the equivalent of a telescope with an aperture of 1.41x.. The summation in the brain in terms of light gathering is approximately the fourth root of 2, 1.19x. And there's no increase in resolution.. that's 1x..
"My guess is that it would take some rather complex optics, and worse than that, some expensive optics." They didn't seem to need all that fancy optics with the dobsonians... So maybe for a quadrosopce you'd get something more complex, but why would two refractors be more complex than two reflectors? And even if the image was flipped: it's not like it would be used for sightseeing or nature-gazing, so I don't really see the issue with that. "And sure, it beat out a 20" scope, but hey, two 18" scopes together should indeed beat out one 20" mirror. No surprise." But the point I was making was, that at a certain point, it would be cheaper to buy two telescopes of smaller aperture, then one of a bigger, since the prices rise exponentially at a certain threshold. that threshold would be lower (in aperture) with apo refractors. And this would augment even more with a quadroscope. There is, for instance, no way 4 times 10" apo's would cost more than one 20" apo. the price-dfference would be at least tenfold for such an aperture. I was just wondering why not more amateur-astronomers have tried this out. For an apo, this threshold may be as low as 8", and for a reflector probably around 20". Yet, most of the examples that actually exist - which proves the concept is valid - is for professional observatory. You have the LBT, the GMT and you had the MMT to first use this concept. If it works there, and it works with the dobsonians, it should work with apo's too, right? I did note that in the article about the dobsonians they said the two 18" together still cost slightly more than one 25", but that's simply because 1) the setting wasn't optimized for it, and 2) the (price-aperture) threshold wasn't reached. If they used 20" it probably would have cost less than a single 28", for instance. You do have a point about more weight, but obviously, for such big apertures, the 'mobility' issue wouldn't be there, since it longer wouldn't be meant to go from starparty to starparty anymore. It's more for your own little home-observatory, to say the least. And if you optimize for it (one gear, one 'tube', one setting (like in the The Large Binocular professional one), would the weight actually be THAT much more compared to the same thing with one large aperture? Edited by SPastroneby, 20 August 2017 - 02:16 PM. If you were going to use four telescopes, that means that each eyepiece would have to collect the beams from two different telescopes. Again, the two telescopes in the binocular telescopes each work with a single eyepiece. There is basically a right angle diagonal so each scope sends the light cone to one eyepiece. One scope, on diagonal, one eyepiece, for each eye. In your dream scope, you have to make the light cone from two telescopes enter a single eyepiece, and you have to make the images arrive in the same orientation. Think about that. What optics would be necessary to get the image from two telescopes to a single eyepiece, assuring that they arrive in the right orientation, and in perfect focus with one another. A picture to show you the nature of the problem of getting four beams into two eyepieces and still allowing for IPD which is even a difficult problem with regular binocular telescopes. And remember, the images must all maintain the same orientation. Edited by Eddgie, 20 August 2017 - 12:58 PM. First off, as Jon noted, the monocular equivalent of a bino has an aperture 1.189X larger, not 1.414X larger. The latter figure of 1.414 (root two) refers to the improvement in signal to noise, which relates to the *areal* aperture ratio; the *linear* aperture equivalent is the square root of root two, or 1.189. Second, the requirement to merge individual optical train images for one eye to view requires a combiner such as a beam splitter, which *will* result in at least a small *loss* compared the use of just the one optical train per eye, making the 'quadocular' concept a fool's errand. Even if the beam combiner optics were of 100% efficiency, you would gain nothing--except for some increase in resolving power *IF*(!) you could maintain phase coherence. If. And that notwithstanding, the requirement for extremely tight tolerances for both similarity of image scale and image alignment, along with the maintenance of stability in optical path length (to eliminate changes in the phase of arriving wavefronts) would make for one demanding, fiddly construct. Laboratory level attention to detail *could* buy a gain in resolving power (via interferometry through objective separation). But as regards the boosting of throughput in order to obtain a brighter image, in optics there is no free lunch. Well, granted, a quadroscope would be a bit more complex, but would the optics really be so complex as to cost 10 times more? I sort of doubt it. And, well, one could start with just an 'ordinary' bino-telescope. Like the one I gave you of the 12" refractors. Do you (or anyone else) knows if they're actually working in unison to provide a x 1,42 equivalent? Or are those just two refractors on one mount, but working separately? Also... why put them both on one side, instead of getting rid of the counterweights and place one at each side? Yes, I've heard that say before, and I also think I saw it in one of those links I gave in my fist post. Of course... how much is subjective, and how much is it *actually* an improvement? I mean, is it just imagining it, or is it actually better than 1,42 times? Also... about the resolution? how comes it is impossible to get more? I mean, I remember clearly when reading about the VLT and the other large telescopes out there, they can achieve a resolution which spans the width of both (or more) mirrors... so I would assume it's theoretically possible with ALL telescopes, even refractors. This would mean, if the lenses/mirrors would be placed 1m away from each other, it should be possible to get a 1m+ resolution. Now, granted, *that* will be more complex, no doubt, sine it would involve optical interferomatry. But anyways, what I'm getting at is: why isn't there more appeal/interest for it by the community (and the manufacturers of telescopes, of course), and why aren't those techniques seeping through from the professional world to the amateur world? It happened for the CCD/CMOS camera's, for high resolution/light sensitive camera's, for 'lucky shot' techniques, for computerized mounts, etc. But adaptive optics and interferometry have been around for two decades by now s well, so why aren't any of those techniques come down in price and permeated to the world of amateur astronomy? Same with my binocular/quadroscope; the MMT was the first to do it, back in the 70ies...we're now 2017... where is the consumer-version of it? So many things, from cars to computers, have come down gigantically in size and cost, yet this sems not to move much at all in this respect. If those techniques could be used by amateur astronomers as well, it would open a whole new era in our domain. Well, I must confess I'm not following you quite with the 1,189 number. It means, what, exactly? Light-gathering power? Resolution? Not to dispute anything, but I remember the numbers of the original MMT (before they placed the 6,5 m mirror in there); it were 6 mirrors of 1,8 meter, and they clearly said it equaled one 4,5 m telescope. I don't think they were just talking about resolution, but more of light-gathering power. So, I don't see why a quadroscope would be a fools errand, if that professional observatory has done exactly the same for decades, and got the equivalent of a 4,5m telescope. why would one with 4 by a fools' errand, and 6 a viable option? Idem with the LBT ; it says: "using two 8.4 m (27 ft) wide mirrors, with centres 14.4 m apart, it has the same light-gathering ability as an 11.8 m (39 ft) wide single circular telescope and detail of a 22.8 m (75 ft) wide one". There, too, you see they use the 1,41 number. and they explicitly mention the resolution as being even far greater (no doubt by using interferometry). Point is, it's clear they don't use the 1,189 , but use the 1,41 number, and they certainly don't see it as un-viable or a fools' errand. It's hard to imagine it would be useless, when the pro's seem to be quite convinced of it working as advertised. So I would assume that, at least in principle, it should work in refractors as well? I suspect that the cost of implementing mechanics and optics fairly common to advanced optical manufacturers would be peanuts compared to the cost of the very uncommon systems necessary for the phase correction of the individual light beams as mentioned by Glenn. The professional institutions that have achieved this are blank cheque players. 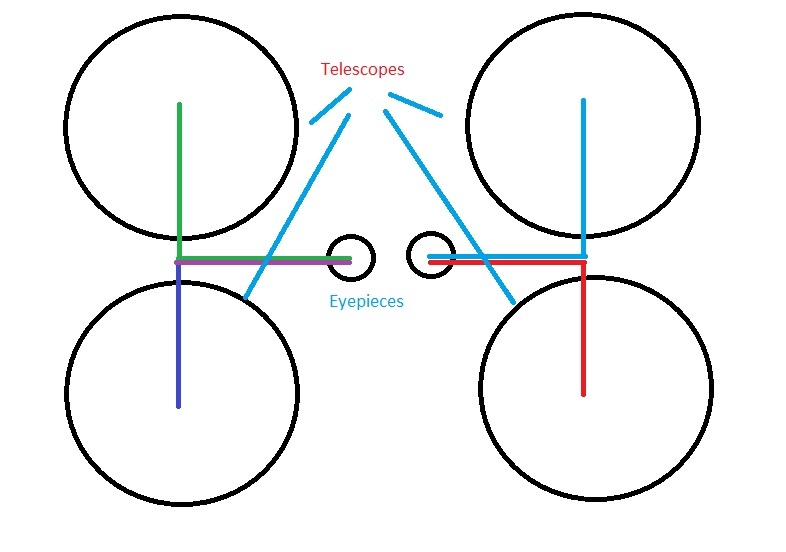 If you are considering what are separate telescope systems whose optical axes are parallel, and then overlapping their pupils via a combiner, this is completely different from a segmented mirror telescope where each element of the objective is a small part of a larger, single optical axis mirror. If the use of two eyes did result in the equivalent mono aperture 1.414X larger, this would imply that when covering then uncovering one eye you should perceive a halving then doubling of image brightness. That would be *really* obvious. This would apply also to the unaided eye, and not just when an optical instrument was involved. But I certainly see no such profound difference, and am not aware of anyone seeing it either. The integration of two essentially identical images in the visual cortex does *not* result in an *additive* increase in signal intensity. All that occurs is that noise is reduced. The same occurs when astro imagers stack a series of images in an averaging scheme. The first two such frames combined reduce noise to the tune of root two. The next two frames reduce noise to (root two)^2. The next four frames reduce noise to (root two)^4. And so on. The image gets no brighter, but ever subtler details emerge. And so it is with our visual system. Two eyes permit to discriminate subtler contrast, which is equivalent to a gain in limiting magnitude of 0.37 and an increase in resolving power by factor 1.189, which both equate to an effective linear increase in aperture of factor 1.189. Actually, the correct way to look at it is this. Cutting out the input from one's second eye results in signal to noise being just 70.7% (the inverse of root two, or 1/1.414) of that realized when both eyes are contributing. To appreciate this, further reading on the topic of signal theory is recommended. Edited by GlennLeDrew, 20 August 2017 - 10:55 PM. I'm not sure about what you mean about the MMT. I remember I once had a correspondence with Grant Williams, Director of the MMT Observatory. The relevant part is this: "The mirrors all have the same axisymmetric figure, they can only be used as separate telescopes, not together as a single primary. For the original MMT the light from those individual telescopes (on a single mount) was combined to increase the collecting area." At least this indicates it are, in effect, 6 different, 'independent' telescopes, who work in unison (on the same mount, of course). This is of course different for the GMT, where all 7 mirrors have the same focuspoint and use a common secondary mirror. But anyhow, overlap or not, if it's possible for the old MMT, why wouldn't it be possible for a pair of dobsonians or refractors? Theoretically, there seems little doubt, but granted, if depends on how fancy/expensive the optics are (didn't seem all THAT difficult seen what is written in the article about the dobs). I'm also not sure about the economics of it, though I'm pretty confident, seen the non-linear rise in price for bigger aperture, there is a threshold it certainly becomes more interesting. Again, the original MMT (currently it uses a single, contiguous primary) was just a way around the then existing limits to how large could be fabricated a single mirror. The JWST is of the same basic design philosophy; all segments represent non-overlapping parts of the pupil. These primaries are in effect *single* mirrors, with a pattern of non-reflecting gaps that act as a complex obstructor in the vein of a multiplicity of secondary support vanes. In this scheme, the additional segments simply act to increase light gathering area. (Naturally, the precision required for their placement and tilt is phenomenal.) It would be just like making, say, a 4-opening mask for a Newt. As each mask is opened in succession, the exit pupil will take on an exactly similar aspect in miniature, growing in total area. So too does a segmented primary have the very same pattern of its primary mirrored in miniature at the exit pupil. The resulting exit pupil for one, two or four combined/overlapping exit pupils would, at best, all have the same brightness. This is due to the fact of partial transmission and reflection (nominally 50/50 for a 2-scope arrangement, and 25/25/25/25 for a 4-scope combination), which total in any conceivable device cannot exceed 100%. Again, in optics there is no free lunch. "Again, the original MMT (currently it uses a single, contiguous primary) was just a way around the then existing limits to how large could be fabricated a single mirror. " True. Well...that and the cost. It's not that it would have been completely impossible to do so technically, but at a staggering cost at that time. This is also the reason they didn't go for 4 mirrors of 4m diameter, for instnce; which clearly was technically possible at the time, but still prohibitively expensive. Which ties a bit with what I said; that it's cheaper to go for an array of smaller mirrors, from a certain threshold of cost. Can we agree on that one? I mean, I'm sure there is no free lunch, and one looses a lot of lightgathering-power and other advantages (that's why they now ultimately went for a 6,5 meter telescope)... but the point for me was, that apparently, in regard to cost-benefit analysis, it's apparently not that bad to go for many smaller than one bigger. And, let's be honest here, those universities/organizations already have far more money than a private citizen anyhow, so a cost-benefit viewpoint in this regard should be even more appealing for individuals or small organizations (like astronomy-clubs going for a fixed observatory) . "These primaries are in effect *single* mirrors, with a pattern of non-reflecting gaps that act as a complex obstructor in the vein of a multiplicity of secondary support vanes." But the question remains; why if it's done by the pro's, isn't it more done by amateurs as well. you mention the difficulty of tilting, but it it's possible to have a perfectly overlapping image, it should also be possible to go for the 'single mirrors that just go for more light-gathering' concept as well. And since the article about the dobsonians described it as *not* being that difficult to align the two, I'm not really seeing the issue of technological impossibility here. Yes, maybe if one was going for a complete optical interferometry where also the resultion augments you'd need super-duper optics and computerized phasecorrectors and what not. But it doesn't seem to be that difficult to get the bino-dobsonians going in tandem. "Now we come to the heart of the matter… how does a binoscope compare to a monocular telescope? In theory a binoscope offers the same performance of a telescope 1,42 times its diameter. In the case of my 18” binoscope, that would be a 25” monocular scope. But that's just optical theory when talking about light gathering power and resolution. In practice a binoscope offers much more contrast and on faint objects delivers like a telescope up to 1,8x its diameter! In my case that would be a 32” monocular scope! The reason for this is that when observing at the limits, the eye accepts a lot of “false” light signals. But the chance that such a false signal’s accepted by both eyes simultaneously is a lot less of course. That's the reason why the background becomes darker with binocular viewing and contrast’s enhanced significantly." It's clear his view and some of those expressed here, differ quite a bit. But regardless, if it's not only for looking with the eyes, but also for AP, the difference would certainly become more obvious. I mean, c'mon, there is a reason things like the LBT was built. If it had no advantages, they wouldn't have build the two mirrors in the same housing and let them work in tandem as one telescope. "A final conclusion is that the √(A2x1.41) formula to which Zarenski (and Harrington) adhere, is invalid. In the first place, there is no scientific basis for this formula. In the second place, the data presented here show otherwise." Thus, the claims of a meagre and overall 1.19 x improvement of a binoscope (or binocular) on all types of objects in comparison to a single mirror/ lens probably seems to be invalid. That is a piece of cake and easily done. Build two telescopes and mount them so they can be aimed simultaneously at the same distant target. This is easy because the hardest part, combining the images, is accomplished via the observers eyes and brain. And there is considerable leeway in the alignment of the two scopes as the eyes/brain combination will compensate to bring the two images together. The hardest, trickiest, most demanding and difficult work, is done by having two eyes connected via one brain. It goes without saying that it does not work at all and there is zero advantage for someone with only one functioning eye. Once you attempt to physically combine multiple images into one image ahead of the sensor, the project becomes far more difficult. From an ATM viewpoint, simply figuring the off axis segments of the individual mirrors is a significant challenge since these are no longer a figure of revolution. Much, much, more difficult than making two individual mirrors to be used in separate on axis configurations. It is so much more difficult that the usual method of creating mirrors for use in unobstructed scopes has been to cut segments from one large mirror. Clearly not a reasonable option for a large aperture multiple mirror scope. Mounting and aligning multiple mirrors to maintain phasing is a whole new project that the binoscope does not encounter. Currently, the best bet to improve the results if using a sensor to capture the image, is through processing of the data via image stacking and filtering. IMHO, the results obtainable are so astounding that it is completely impractical to pursue marginal improvement in monocular views by using multiple mirrors to simulate a larger aperture. For the vast majority of us, a remarkable improvement in what we can see can be had by simply packing up and going to better skies. There is simply no substitute for clear, dark, steady skies. And don't forget your binoculars! But the question remains; why if it's done by the pro's, isn't it more done by amateurs as well. The pros do it because they have to, they cannot fabricate a large monolithic mirror. The Keck segments are 1.8 meters wide, 7 cm thick. The electro-mechanical system that keeps the mirrors aligned to the fractions of wave lengths necessary is complex and expensive.. The Apache Point Observatory has a 3.5 meter which I believe is monolithic. The pros use monolithic mirrors when possible, the Kecks 36 segments are 71 inches.. That ought to tell you what the pros think of segmented mirrors versus monolithic mirrors. When amateur astronomers are building Scopes with mirrors greater than 3.5 meters.. That's the time to look to the Pros..
Actually that's wrong.. Looking at the pros for amateur sized Scopes shows you that the pros use monolithic mirrors in these sizes..
One can verify for oneself what are the gains realized by binocular summation. This can be done with the unaided eye, an opera glass, an average bino, a large bino, or a monster binoscope. In all instances the improvement for any one observer as regards resolution and limiting magnitude will be the same. That is, if for the unaided eye the use of both realized a gain in limiting magnitude of, say, 0.3m, over a single eye, the same gain would apply for any other instrument, at least for an exit pupil not much smaller than the iris diameter. If visual system summation were indeed to result in a mono linear aperture equivalent of factor 1.4, this would necessarily mean that linear resolving power must be better by 40%, and that the limiting magnitude must improve by 0.75m. Does anyone reading this feel that such a marked improvement obtains for them? That would be astounding. Back to the instrumental part. I'm not completely clear if we're yet fully on the same 'wavelength'. Are you suggesting to build what is effectively an 'MMT' for each of the two telescopes making up the binocular? Or are you positing the notion of building *each* half of a bino from two or more *individual* primaries as installed in the typical Newt, combining their images via a beamsplitter or some such? A visual scope of the 'MMT' type has each segment of its primary mirror contributing to its very own, unique segment in the exit pupil. None of these segments has its exit pupil equivalent overlapping in the slightest with any other. Each and every segment increases the size/area of the exit pupil. Each and every off-axis segment has its optical axis coincident with that for the central segment. If the outer segments are figured individually, the surface shape must be formed as an outer portion of a paraboloid, with its optical axis *outside* the thing, which is no simple matter! Two or more *individual*, standalone primaries as would be taken from a typical Newt cannot be configured so as to occupy separate portions of the exit pupil; the aberrations due to incorrect tilt would be ghastly. Such mirrors, having figures of revolution about an axis passing perpendicularly through their centers, must have these axes parallel, thus requiring to bring into coincidence their optical axes via a beamsplitter. This in turn makes for overlapping exit pupils, and not an increase in exit pupil size/area. If I'm needlessly repeating myself, I apologize. This communicating in a slow exchange of written words too easily leads to misperception. I think this quote completely nails it! "If visual system summation were indeed to result in a mono linear aperture equivalent of factor 1.4, this would necessarily mean that linear resolving power must be better by 40%, and that the limiting magnitude must improve by 0.75m. Does anyone reading this feel that such a marked improvement obtains for them? That would be astounding." The pdf there goes to great lengths to actually test it. they clearly indicate it's between 1,4 and 1,5, rather than 1,19. They also say a large part of the amateur astronomers going for the 1,19 has it wrong, since they base themselves upon an unproven premise for their formula. I mean... I'm not trying to take sides here, but they at least tried to measure it directly. In contrast people 'feeling' they have an improvement of 1,19 versus 1,42 seems rather vague and superfluous. In an objective/scientific context, what the authors say has more weight, seen their effort in directly measuring it and the data they got. Granted, there is some room for bias, and they didn't do a double-blind test with statistical analysis, but it's still better than "I don't feel it's that big an improvement" from the other side. Let me ask it in another manner: does the bino-crowd that go for the 1,19 number actually have similar hard data of tests they did, in a consistent manner? If so, I would love to see the pdf of that one, so we can compare. Otherwise... I would claim actual data trumps theorizing. And given the facts thusfar, one can only lean - rationally spoken - towards the 1,42 number. This would change if there is hard data (in contrast to theorizing or feelings) to support the 1,19 number, of course. @the rest: yes, pro's do it because it's hard and thus extremely costly to make one giant mirror and thus go for many smaller ones. This would hold true for amateur astronomers with less money even more, though. It still should have advantages though: there is no reason to place two mirrors in tandem (in the LBT) if it has no (or almost no) advantage; in that case, one mirror would be FAR more cost effective, after all. (Or two separate mirrors). Btw, I appreciate the answers given. I know I'm repeating as well. ;-) It's just that some things seem a bit unclear or contradictory in some aspects, so one needs to take time to see what all the arguments and counter-arguments can/could be. You clearly feel as if there is benefit. I don't know why people are arguing with you anymore. I am looking forward to seeing your design. How are you going to combine the light cones? That was my question and you have yet to present any thoughts on that. Heh. Well, I was actually questioning what the pro and cons were, and why not more amateur astronomers are going for it, seen the fact that the pro's do. One of the biggest counters was the 1,19 number, which indeed, if true, would mean it makes a lot less sense to go for binobsonians. But to that there is the pdf/research that counter it, and if *that* is true, then the former explanation doesn't hold anymore. I'm just going for the discussion here. It's clear one of both has to wrong. As for me actually *building* one, that wasn't implied here, and in fact, that's far out my league as of yet. I'm new at amateur-astronomy, after all. Which might be a disadvantage as not being thoroughly versed in the intricacies of amateur-astronomy, yet it might also be an advantage as to not be bound by too much 'majority thinking' where a certain idea is being entrenched to the point of making it difficult to think out of the box. I guess in this respect, I'm not alone in that, since researching it further and having read the whole pdf now, I note the author says a bit the same: that a lot of the traditional amateur-astronomy crowd are so convinced of the 1,19 number while there is no objective proof of it, and actual testing rather indicates the 1,42 is correct, that it becomes a detriment and limiting factor for bino-telescopes to break through. He laments a bit the 'traditional wisdom' that took root in this respect, thus. Of course, I'm not blind to it potentially having some bias as well, but the point is, I've seen little actually direct rebuttal to what is said in the pdf. With what and which data, exactly, does the 1,19 bino-people do not agree with, in that pdf? What is the counter, and have they also data to substantiate their claim? And then, further: if the 1,42 number is right, isn't it also true that at a certain aperture-diameter, it becomes more (financial) favorable to go for a bino with smaller aperture; then for a mono with a larger mirror or lens? I mean, no doubt people here are right it's not that easy or cheap, but is it truly SO difficult that it outweighs the gain? Or is it that people think there is no gain, and is that impression right (aka, based on facts)? Maybe the fact they're not much manufactored (or the optics aren't finetuned for it) by manufacturers is a bit of a chicken and egg problem? There being no demand means there is also little incentive to make them. I can imagine this same discussion going on for the first CCD and CMOS camera's being used by pro's, many years ago. Wouldn't people here have said, too: but it's not that easy, it's expensive, it's only something for pro's with big money, etc.? Yet, here we are, and at least on this front, things got cheaper, mass-produced, and we're all using products now that a few decades ago we could only dream of. I'm actually wondering which technological breakthrough seeps further from the pro-realm to amateurs, and which not, and why. But maybe I'll make another post/thread about that. I could imagine, if enough people wanted binosonians, a system of auto- collimating them by telescope-manufacturers would become normal too, for instance. Of course, for that, there has to be an advantage for them in the first place, hence my question. And the answers have been interesting, and may be correct, but remain a bit vague. Has anyone here actually made tests with hard data for the 1,42 vs 1,19, for instance? Has anyone compared the actual price vs capabilities (aka, cost-benefit) for 1 large mono versus two smaller mirrors? Etc. I realise I'm only pondering in a theoretical sense as well, so I'm not disappointed to get theoretical answers back, but I would love to find some hard data on it, or at least, more than just a 'feeling'. You can do the experiment yourself with a pair of binoculars. I think most of us us have done it.. Have you done it? You could even use aperture masks to redipuce the aperture of the binoculars so you could determine the amount of aperture reduction the resulted in equal views. One would need binos that were operating at full aperture.. But the 1.41 number says that a pair of 10 x 50s would the view using one eye through a pair of 10x70s. Anyone who has used both know that a single eyed 10x70 shows dramatically more. Look around.. How many bino Dobsonans are there? They're extremely rare.. I spent some time explaining why multiple mirror telescopes are used in the largest observatories but not by amateurs nor in most scientific observartories. I take it by your silence that you are in agreement. There are two separate problems. First, suppose two telescopes of 100mm each combined into a single (monocular) eyepiece. Their light gathering ability would be equal to a single 142mm telescope (here is the area which matter). Second, supposte two telescope of 100mm each used to make a binoscope (i.e. one eye--> one telescope). Here the binocular summation apply, and their light gathering (for visual use obviously) could be considered equivalent to a 119mm monocular telescope. A much more efficient way to increase the light ability is to concentrate the lights of all 4 telescopes into a single eyepiece: 100mm*1.41*1.41=200mm. If a kind of reverse beam-splitter could be made, with 4 100mm ED doublet you obtain a 200mm ED telescope - cost saving, yes! But the optics to merge the light of 4 telescopes intoa single eyepiece would be super difficult. What they do in real life is a different application: 4 telescopes with 4 cameras (and many more). 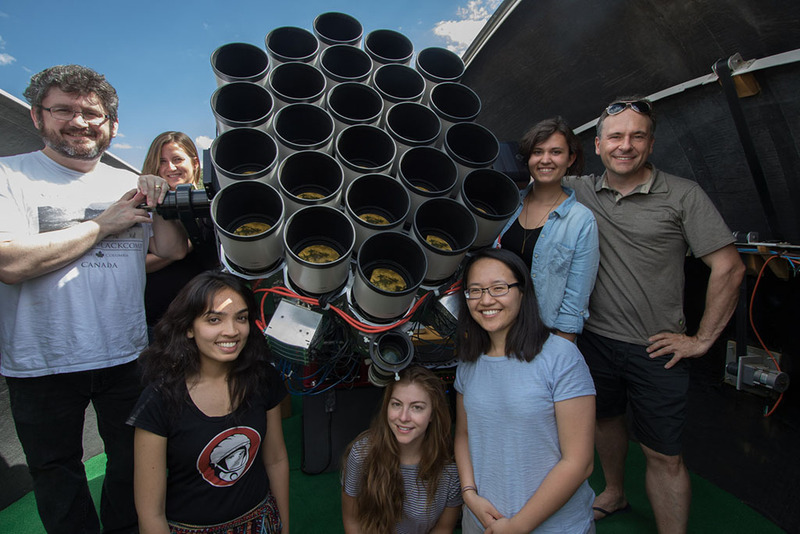 Dragonfly is an innovative, multi-lens array designed for ultra-low surface brightness astronomy at visible wavelengths. Commissioned in 2013 with only three lenses, the array is growing in size and proving capable of detecting extremely faint, complex structure around galaxies. The most recent upgrade—completed in 2016—saw Dragonfly grow to 48 lenses in two clusters. Edited by Riccardo_italy, 24 August 2017 - 09:52 AM. I read the PDF in which the test protocol involved very brief flashes of light, comparing counts seen with one eye vs two. This *may* not be as relevant as detecting an otherwise steady source near the threshold of visibility. Our view of the world about us is in the main a 'steady' scene (discounting motion of objects), not a flickering one. For us astronomer types, seeing faint stars is a common and relevant discriminator. Most observers report a gain of 0.3-0.35 magnitudes for two-eyed views, whereas theory suggests 0.37m, corresponding to a linear aperture increase of factor 1.189. No one possessing reasonably similar eyes I've ever encountered claimed a gain of 0.75m, which would equate to an effective linear aperture increase of factor 1.414. If the improvement were to be that profound, I could hardly imagine anyone willingly squinting through a monoscope. Electron Shell = Gravity Shield?